Hello, and welcome to the Red Sox Hotline. We are here to help you and your family cope with the events of the past 24 hours in a safe and beneficial manner. With that in mind, please back away from your neighbor's camouflage and crossbow, place all sharp metal objects back in the tool shed, and follow these easy steps to getting beyond Saturday night's 5-hour, 14-minute American League Championship Series 13-6 crash landing against the Cleveland Indians. We are aware that many of you are angry, sleep-deprived, and possibly frostbitten, but it's time to dismiss this unpleasant experience in the same manner you would had you paid $140 to watch a very long movie with a very bad ending that was held outdoors, in cool temperatures, and droned on into the wee hours of the morning. Hmmm. When you put it that way, no wonder you are having trouble. So what can we do to get you back on track? First and foremost, you must forget about Eric Gagné. That's right. I mean you. If this requires shaving your beard or asking your brother to replace his bug-eyed sunglasses with prescription contacts, then do so immediately. If it means temporarily cutting ties with Canadian relatives, I'm sure they will understand. Venting over Gagné's inability to get through the 11th inning is a pointless exercise. He has been ineffective since he joined the Red Sox in a July 31 trade that cost them young lefthander Kason Gabbard and outfielders David Murphy and Engel Beltre. The Red Sox have given Gagné every opportunity to become a key contributor out of the bullpen, but he is allergic to clean innings and uneventful outings. He inspires absolutely no confidence, and he's as popular right now as Mike Torrez was in '78. Put him in your rearview mirror. He will not be on the mound again in another meaningful game. In fact, he was only used in Game 2 because manager Terry Francona's options had dwindled to the bottom of the bullpen barrel. If the Red Sox advance to the World Series, who would be shocked if You Know Who's name wasn't even on the roster? It would be a relief. OK now, breathe in some of that karma. It has come to our attention you are also confused about Javier Lopez. He is supposed to be a specialist who flummoxes lefthanders, and yet, southpaw batters are hitting .293 against him. Trot Nixon, whose anemic numbers in 2007 included a .224 average against lefthanded pitchers, tagged him for the winning RBI. The Hotline suggests you channel some of that negative bullpen energy to a happier place. If you must dwell on Game 2 relievers, then conjure up images of Hideki Okajima, who pitched 1 2/3 innings and did not give up a run, and that included escaping unscathed from a bases-loaded, two-out situation in the sixth. Okajima submitted a clean, workmanlike seventh, then gave way to veteran Mike Timlin in the eighth. He, too, knocked them down in order, giving way to Jonathan Papelbon, who pitched scoreless ninth and 10th innings. Had this been a regulation game, the lithe reliever would have been Riverdancing his way to Cleveland. Now I ask you: Who do you think will figure more prominently in this ALCS as we proceed? Papelbon, Okajima, and Timlin, or Gagné and Lopez? Based on the volume of calls we've received, the issue of starting pitching is weighing heavily on your minds this morning, particularly since Curt Schilling, whose postseason résumé was cluttered with superlatives, came up, in his own words, "small in a big game." The Hotline recognizes this was a disheartening development since the elder statesman had shown a penchant for grinding it out through this long, difficult season. But we've known for some time Schilling is in the midst of a metamorphosis from power pitcher to placement pitcher, and when the gun tells you his fastball is topping off at 88 miles per hour, you know there will be nights like this. Hey, it's not as though Cleveland's No. 2 stud, Fausto Carmona, buried him or anything. Carmona departed in the fourth inning after throwing 100 pitches, giving up four runs and issuing five walks. 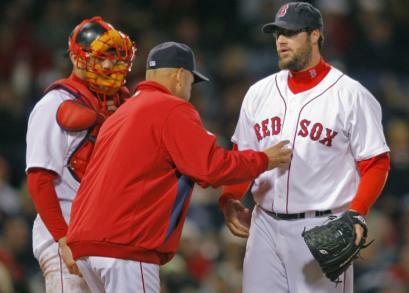 To date, only one of the first four alleged "big-game" pitchers has fit the bill: Game 1 Sox starter Josh Beckett. Since Beckett threw only 80 pitches in his victory, he will be fully rested for his scheduled start in Game 5 on five days' rest. He is a magnet for run support and while Boston's hitters fell silent over the final five innings of Game 2, the meat of the order (Ortiz, Ramírez, and Lowell) remains formidable. That trio went a combined 0 for 6 in those final five innings, but it's unrealistic to expect them to reach base every single time, as both Ortiz and Ramírez did in Game 1. It's also unrealistic to expect the Red Sox to plow through these playoffs undefeated. They have relinquished home-field advantage, which is hardly trivial, but if they win tonight behind Daisuke Matsuzaka, they will have wrestled it back. Francona assured the masses there will be no residual fallout from the 13-6 shellacking his team endured in Game 2. "If this does us in," Francona said, "then we're not as good as we thought we were."